Wow, I had a fantastic time at Michael Kaeshammer's concert with the Edmonton Symphony Orchestra (ESO) with opening artist, Jill Barber. It was like being transferred to another time. 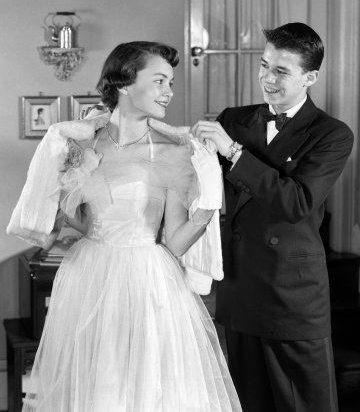 A time when singers sang into rectangular metallic microphones, where dresses were more crinoline than fabric, and getting dressed up to go to a dance was a ritualistic coming-of-age event. O.k, so I can't confess that I've lived those those golden times, but my stereotypical images are heavily influenced by the 1955 scenes from Back to the Future. And from what I can tell? It was one classy era. I definitely felt classy listening to the warm and smoky tones of Barber's voice. Not only is she gorgeous to listen to and watch with her expressive face and arms, but her sweetheart halter dress did not disappoint my fashion expectations of her. She opened with a new song, "Mischevious Moon," which is the name of her new album to be due out in the Spring. She also made her way through audience favorites such as "Chances" and "Never Quit Loving You." During the performance, she detailed a heartwarming story about girl meets boy, girl meets another boy, girl meets man, girl becomes woman, and man and woman marry. Heart wrenching past histories and happy endings seem to inspire love songs. She introduced her final song, "Oh My My," with a story about how the tune came to be. She woke up singing it in a dream. Barber was also eager to receive audience participation to echo her choruses, and although the audience gave a good try, it wasn't anything compared to what I heard Folk Fest crowds belting out from the hillside. Her short opening set list was over to soon for my liking but hopefully I will have the chance to see her again soon. Maybe the Edmonton Symphony Orchestra will bring her back for another joint concert? A girl can hope. Of course, the headliner of the evening was Kaeshammer and I can definitely see why. He is a pianist, vocalist, and conductor all-in-one that happens to have fantastic showmanship skills as well. He radiates energy on stage and, frankly, sometimes I don't know how he managed to stay seated on the piano bench. At any moment in the program he could be found simultaneously playing the grand piano with one hand, with another hand on the electric keyboard behind him, tapping his left foot to the beat and bending his right ear to his right shoulder to signal the downbeat to his band members. Kaeshammer succeeded in making the expansive Winspear Centre feel like an intimate nightclub that happened to have excellent acoustics. He did some lovely orchestral arrangements of "Mary's Boy Child," "Merry Christmas Baby," "Marshmallow World," and "I'll be Home for Christmas" with the ESO in addition to his toe-tappingly catchy solo pieces such as "Lovelight." The ESO definitely was more of a back-up band since his own personal band was at the forefront, both physically and musically. However, it's not everyday I hear such orchestral richness backing up a boogie woogie musical act so it was quite a treat. Another amazing point in the program? Definitely when Kaeshammer had a little musical face-off with his drummer where they tried to surpass each other in tempo and musical technicality. Overall, a fantastic way to start December and the Christmas season! Take care and stay warm readers! Kaeshammer and his drummer reminded me that I really need to get over to the Yardbird. It was a fantastic night filled with great music! I'm glad Kaeshammer and Barber posted that Moon River duet. I wish they did something together in the concert! december.., i love to listen christmas music.., especially if your the artist. Agreed-December is a wonderful time for music and making music if you're an artist!